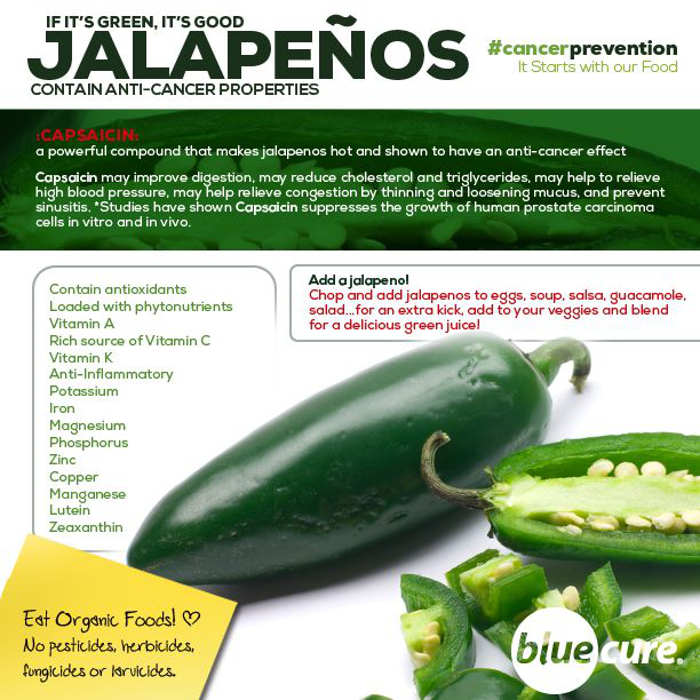 Jalapeno Pepper - Are You Ready for a Change? Weight loss: Peppers contain a chemical known as capsaicin, which is actually what gives peppers their hot properties. Capsaicin is also good for helping you lose weight, and is commonly found in many weight loss pills and supplements. How does capsaicin help you lose weight? Very simply. It literally burns away calories and fat. So that hot feeling you get from eating peppers is also burning away the pounds. Arthritis: Capsaicin also acts as an anti-inflammatory, which makes it great for reducing swelling and pain in those who suffer from arthritis. So stock up on some jalapeno peppers if you have arthritis. Cancer: The capsaicin found in peppers actually is able to kill some cancer cells, specifically prostate cancer cells. Does this mean a cure for cancer is just around the corner? We can always hope. Headaches: The capsaicin in peppers is also known to block the neuropeptide known as Substance P, which is a main pain transmitter to the brain. What this means is that peppers can actually help to ease pain. So get some jalapenos if you are having headaches, and let those pains go away. Nasal congestion: This one might seem a bit obvious. The heat in peppers, again caused by capsaicin, clears the sinuses. It even helps to fight sinus infections by cleansing the airways. This means you can literally breath easier with the help of jalapeno peppers. Ulcers: Peppers might not be able to cure stomach ulcers, but they can prevent the ulcers from happening in the first place. How? Peppers kill bad bacteria in the stomach and intestines, and often this bacteria is what leads to stomach ulcers. High blood pressure: Jalapenos are a chili pepper, and chili peppers commonly have lots of flavinoids, Vitamin C and Vitamin A. And guess what those things are good for? Lowering one’s blood pressure. Fluid loss: Too much fluid in the body can be bad in multiple ways, but most commonly it’s bad for the heart. See, all that fluid can build up around the heart, thus putting a strain on the heart and potentially damaging it. One sign of too much fluid retention is swollen ankles. Another symptom is difficulty in breathing, because the fluid is putting pressure on the lungs. Check with your doctor if you believe you might suffer from too much fluid in your body, and also ask him or her about peppers. Why? Because peppers cause you to sweat, and the more you sweat, the less fluid there is in your body. Heart attack: Numerous studies have shown that in countries where peppers are common in the diet, the citizens there have fewer heart attacks. Many of the benefits of peppers listed above can help against heart attacks, but some studies have also shown that peppers inhibit the buildup of fibrin in the body, and fibrin is a major ingredient for blood clots to form. Anti-oxidant properties: Because of the flavinoids and vitamins found in jalapeno peppers, these peppers are excellent anti-oxidants, which means they work within the bloodstream to help the body fight off and heal from damaging cells.